Monthly totals will depend on Calendar weeks per month. Piano Ensemble – Performing in Concerts and Competitions. Piano Ensemble – Piano Virtuoso Technique and Musicianship Skills. Piano Ensemble – Pre Grade / Grade 1 ABRSM Pianoforte Exam and Qualifications. Piano Ensemble – Composition, Interpretation, Music Production, Improvisation Skills. Pupils should practice a minimum 30minutes daily work rehearsed previously learnt in class. Pupils to attend class every week on Wednesdays on time ensuring punctuality dates aligned with school term calendar. Pupils to bring their music books provided by school to lessons. This School is a personal project of Aaron Monteverde in extension to his music education projects locally. Aaron Monteverde currently teaches 1 to 1 Piano Lessons in GAMPA Gibraltar Academy and started to open this new school with piano ensemble facilities as a new project for Gibraltar. The aim of this school which only caters for 25 pupils per year is to connect local piano pupils with a certain level of piano playing starting from beginners to Grade ABRSM Levels, already learning piano with local private music teachers so that Aaron Monteverde can make and create and produce and take on performing opportunities with the talent presented to him. That is why Aaron Monteverde wishes to ask full collaboration of all Piano Teachers and ask them to encourage their best able pupils to become part of this new school and have extra piano lessons to get extra skills separate to the work teachers are teaching already. Piano pupils who are only learning exams Grades will benefit enormously as they will be having new repertoire and techniques and together with friends doing music together, but never forgetting to continuing the important piano learning with their original piano teachers. At the End of the year Aaron Monteverde Piano Music School will be putting on a local and international concert where all his ensembles will perform and compete to win 1st prize which is to produce and launch a Music Album which will be signed up to Aaron Monteverde Music Record Label, MMI Monteverde Music International and sold on Itunes. 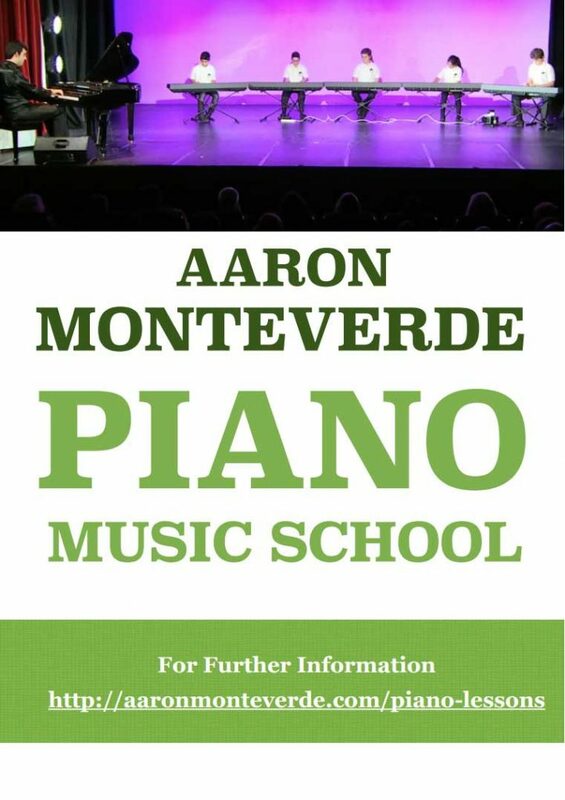 Here are two videos broadcasted by GBC Gibraltar Broadcasting Corporation where Aaron Monteverde Piano Music School was Launched via his Pupils performing live in concert, judge for yourself…!